While Inlander Restaurant Week is a welcome reason to revisit favorite old spots you haven't been to in a while, it's also a perfect opportunity to expand your palate and explore new flavors from around the world, all while dining right here in your own backyard. Consider the Inlander Restaurant Week menus a passport for culinary exploration, and then use that passport to circle the globe on a trip full of delicious options. First stop? How about Asia, where several of our restaurants found inspiration for some incredible dishes. Chef Lu's Asian Bistro on Spokane's South Hill has a barbecue pork slow-cooked to perfection, and Nudo features barbecue pork in their incredible tonkotsu ramen. The Boiler Room gives its Asian approach a twist via a Korean kalbi pizza, with a pie topped with braised short ribs, Korean barbecue sauce, garlic, scallions and kimchi. Hop a ride to Europe where Italian flavors rule at a few of our restaurants. Italia Trattoria is always a highlight of the week, and this year is no different thanks to their grilled pork tenderloin served with parmesan potato fondant and olive piccata sauce. Latah Bistro is doing an enticing Italian-style grilled octopus, while the Italian Kitchen is spicing things up with a blackened halibut dish served over a parmesan veggie risotto. Staying on the continent, more options rise up from Fleur de Sel's French menu and dishes like their chicken confit Provencal. Laguna Cafe brings a Portuguese chicken stew to the party — it's a keto diet-friendly dish full of chicken, chorizo, shallots, peppers, daikon and kalamata olives. And Das Stein Haus has a menu full of German favorites like the rouladen, a dish of thinly sliced beef stuffed and rolled with bacon, red onion, pickle and German mustard. You'll probably want a beer with that one. If spicy flavors from south of the U.S. border are more your taste, be sure to drop by Remedy Kitchen for its popular chile verde, or the Tortilla Union Southwest Grill for its crab avocado quesadilla. The combination of blue crab, avocado and Cajun sauce make for a creamy, crabby dish with some kick. Indulgence is easy to find on this year's menus. The Davenport Tower's Safari Room Fresh Bar & Grill is starting things off with its bacon beer cheese soup, a creamy treat that's simmered with Stella Artois beer and special seasonings. Cheese lovers can also find their fill of the ultimate comfort food classic with Flame & Cork's wood-fired mac and cheese, also gluten free. Pepper jack mac and cheese is choice at Red Tail Bar & Grill at the Coeur d'Alene Casino, which is also cooking plenty more comforting favorites, including a meatloaf sandwich entree and fry bread sundae for dessert. Over at its sister restaurant, Chinook Steak, Pasta & Spirits, a standout is the five-cheese poutine. Meatloaf from a restaurant is not going to be like your mom's, and we expect this to be true at Barlow's Restaurant in Liberty Lake, which has a homestyle recipe on its menu, along with two other nostalgic, homey favorites: pot roast and chicken fettuccine. In downtown Spokane, creative comfort food twists is a focus of the new-in-2018 Heritage Bar & Kitchen, which is spotlighting several house favorites during Restaurant Week, including its hash brown burger — yep, that's a beef patty between two hash brown "buns" — as well as its famous "Fancy Nancy," handheld meat pies that are like a sloppy-Joe-meets-hot-pocket but, you know, really good. For dessert, don't miss the deep-fried PB&J. Classic fried goodness can also be found in the synonymous deep-fried mac and cheese bites at Saranac Public House, as well as, obviously, fried ravioli at Ferraro's. Go old school at the Lantern Tap House with chicken pot pie, and at RadiCCi Italian Bistro with a classic simply titled "Grandma's Spaghetti." EPIC Sports Bar at Northern Quest Resort & Casino has a classic sweet treat for dessert in the form of pineapple upside down cake, and at Gilded Unicorn downtown, the "Fat Elvis" is a sourdough liege waffle topped with bacon jam, banana ice cream and a peanut butter mousse. Um, whoa. One of the best aspects of dining out in the Inland Northwest is just how many places take advantage of our lakes, rivers, streams, even oceans to fill their menus with fabulous fish dishes. Cedars Floating Restaurant in Coeur d'Alene is featuring a lobster bisque on its menu, an irresistible smooth soup full of lobster, scallops and prawns. Hard to beat that as an opening course. CorkHouse in Liberty Lake is offering two Dungeness crab cakes on its menu, while Spokane's Table 13 gives a similar dish a twist with its king salmon cakes served with winter greens and Yukon potatoes. Beverly's in Coeur d'Alene has a little something for everyone with their seafood trio dish, which includes togarashi seared hamachi, shrimp ceviche and sesame-crusted Hawaiian tuna. The Anthony's locations in both Spokane and Coeur d'Alene have a delightful sharable plate in their Hawaiian ahi nachos, with poke served up on taro chips with a little wasabi aioli on the side to spice things up. Another great sharable? Be sure to check out the South Hill Grill's fried calamari, featuring calamari cut in house and fried in a delicious beer batter, then topped with pickled jalapenos and garlic aioli. Raw oysters are a delightful addition to many local menus, and seem to be increasingly common, but you don't see fried oysters every day in the Inland Northwest, so a trip to the Centennial Restaurant could be in order this Inlander Restaurant Week. Main fish courses abound on this year's menus and you'll find plenty of places offering a classic salmon or Idaho trout dish. The Twigs on the South Hill spices up the options with their red curry halibut, which is pan-roasted and served over cilantro rice. 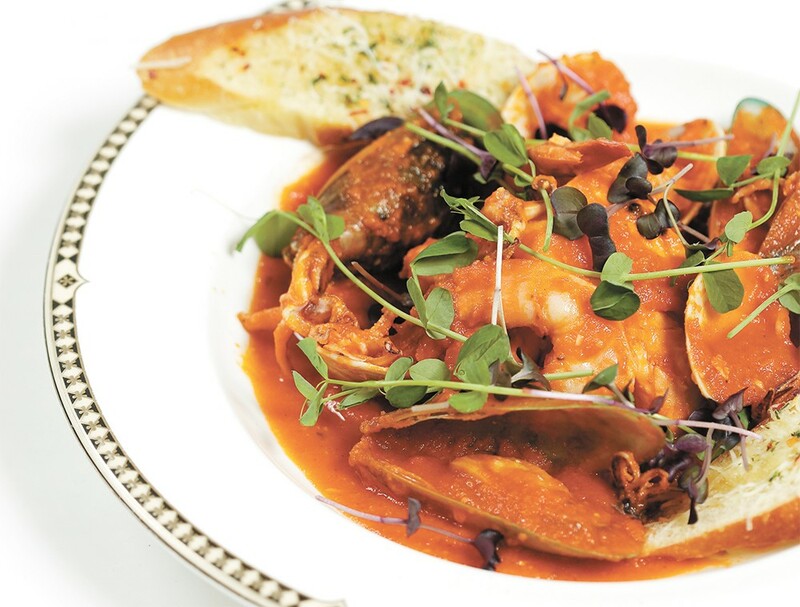 Steelhead Bar & Grille has a hearty seafood cioppino on the menu, its combination of clams, mussels, scallops and shrimp showcasing a lot of seafood lovers' favorites. And if cod is your fish of choice, check out the Barrel Steak & Seafood House's pan-seared wild Alaskan cod, served with cherry tomatoes and fresh basil. It's become really easy to eat your way through Inlander Restaurant Week with nary an animal product in sight. And we're not just talking about salads, either, although there are some excellent ones in store at Durkin's Liquor Bar (kale and hummus salad) and Wandering Table (squash pear salad). No doubt you've seen butternut squash soup on many a menu since fall, but have you seen the likes of the version served by Current Kitchen & Bar, which includes maple syrup and smoked marshmallow? Yes, you read that correctly — marshmallow! The creativity of our local food scene really gets showcased in the myriad preparations you'll find for the vegan and vegetarian dishes. Central Food even has a menu entirely made up for meat-free diners — don't sleep on their pumpkin pasta, seriously — while dozens of other spots have vegetable-focused dishes that will appeal to everyone. Take Clover's Parisian gnocchi, for example, served with a medley of winter vegetables like parsnips, red bell peppers, tri-color carrots and squash in one of the homier eating environments you'll find among this year's restaurants. Table 13 also tackles a gnocchi dish, this one featuring wild mushrooms, burrata cheese and caramelized onions. Scratch's herb-infused pasta arrives with onions, mushrooms, shaved asparagus and a red pepper romesco cream sauce that will have you wiping up every last drop. Tamarack Public House has an eye-popping tri-colored quinoa pilaf stuffing its roasted delicata squash, while Nudo's vegetable ramen will help fight off any chill outside with its heady broth full of broccoli, carrots, corn, mushrooms and baby bok choy. And there's no reason eating vegetarian doesn't mean eating hearty — just take a look at Iron Goat Brewing's sweet potato curry dish, or Casper Fry's Hoppin' John black-eyed pea cakes. This year's Inlander Restaurant Week menus are likewise full of new flavors and old favorites. Meat lovers certainly won't go hungry, no matter their beast of choice. Even the appetizers and first courses get in the act this year. Downriver Grill has a braised wild boar crostini on its menu, which was the 2018 Epicurean Delight award-winner for appetizers. The Blackbird managed to find a way to get some of their killer barbecue into a salad with the barbecue brisket wedge salad. You can give yourself points for eating healthy while eating delicious brisket! Truly, they're doing God's work. Europa Restaurant and Bakery has a steak salad on the menu served with roasted pumpkin seeds and Gorgonzola cheese along with its top sirloin. Steaks look like the star attractions at a few spots this year. Masselow's at Northern Quest Resort & Casino know their way around a steak, and you can bet that 14-ounce ribeye will be incredible. Downriver Grill has a 7-ounce filet mignon, while the Barrel is doing a blackened ribeye and Tamarack has a New York steak in store. If you love beef but want something besides steak, consider a stop by the Post Street Ale House for some of the peach-bourbon glazed beef medallions. Rib lovers have options ranging from Red Tail Bar & Grill at the Coeur d'Alene Casino in Worley, where they're served six slow-smoked pork ribs in a few different sauces, to the Longhorn's rib platter, where the venerable barbecue spot is combining St. Louis ribs, rib tips and baby back ribs in one entree. Pork is the star at Palm Court Grill, where the prime pork ribeye is rubbed in coriander and pan-seared, served with butternut squash risotto and seasonal veggies. At the Three Peaks Kitchen & Bar at the Spokane Tribe Casino in Airway Heights, pork belly is braised and then fried, served on a watermelon block with some house-made cotton candy. That's some serious creativity, people! Coeur d'Alene's Global Kitchen puts its spotlight on a rack of lamb, served with a Brussels sprouts hash, while Spencer's for Steaks and Chops likewise features its Epicurean Delight award-winning pan-seared lamb tenderloin, served with an English pea and mint puree. Not too long ago, it was pretty difficult for diners with dietary restrictions to find Inlander Restaurant Week menus offering more than a salad marked gluten-free. That's changed greatly in recent years, however, and this year's menus are a major indication of restaurants' willingness to cater to this customer demographic. These dishes are sure to win big even for those who don't live with Celiac's disease or gluten sensitivity, with creative flavors, plating and texture. They're also great options for carb-avoiding dieters looking to stick to their resolutions. In Liberty Lake, Flame and Cork Wood Fired Pizza is serving a gluten-free and veggie-friendly wild mushroom and brie pizza that's loaded with a garlic cream sauce, wild mushrooms, caramelized shallots, brie cheese and fresh thyme atop its signature gluten-free pizza crust. That's not the only gluten-free dish on its menu; one featured starter is a wood-fired mac and cheese with a smoked gouda cream sauce and there's a creme brulee for dessert. 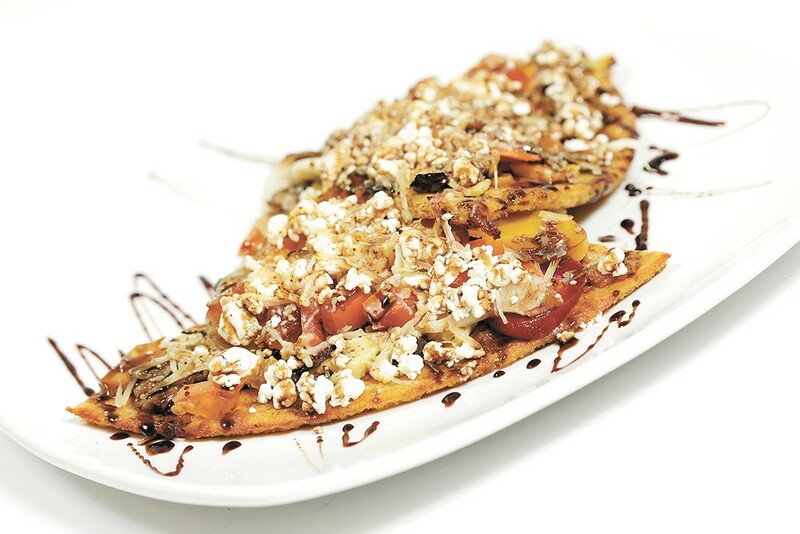 Gluten-friendly pizza is also on the menu at Palouse Bar & Grill in the form of its roast veggie pizza, an entree choice made on a cauliflower crust that's then overflowing with roasted veggies, feta and parmesan cheese, a smoked tomato basil sauce and balsamic gastrique. Many restaurants this year are featuring at least one (or more) gluten-free option for each course, and we couldn't help but notice this trend at 315 Martinis & Tapas in Coeur d'Alene, which is serving an entirely gluten-free menu of its small plates favorites, including its black and white ahi tuna, pork osso bucco and more. 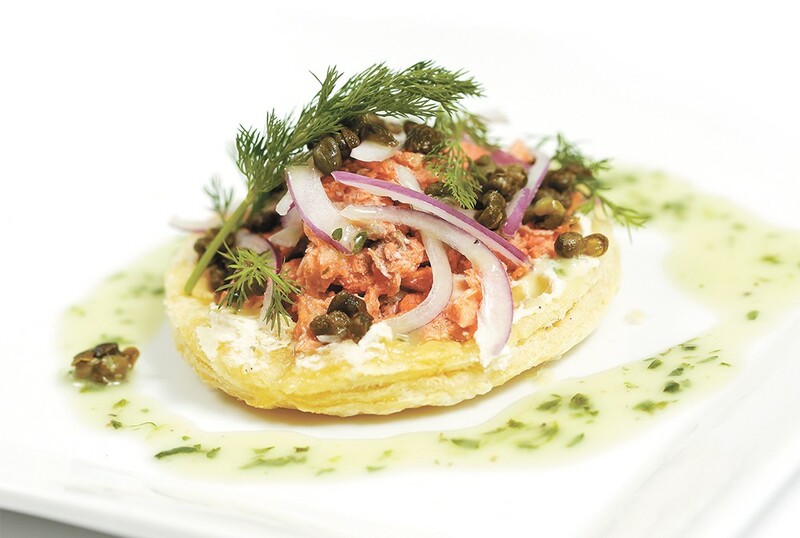 Also in North Idaho, French cuisine favorite Fleur de Sel offers at least one option each course that's made sans gluten, including smoked beef carpaccio and chicken confit. In addition to offering an entire vegetarian-friendly menu during Restaurant Week, Central Food boasts plenty of no-gluten choices, from raw chocolate spiced Brussels sprouts with a honey-soy glaze to vegan chickpea tacos on corn tortillas with avocado salsa verde and pickled carrots. Flourless dishes steal the show at Republic Kitchen + Taphouse in Post Falls, with its curried cauliflower bites topped in a citrus yogurt sauce, along with buffalo duck drums and a baked apple cheddar cobbler for dessert. These dishes are just a small slice of the many gluten-free offerings being served during 2019's event; look for the GF or GFA (gluten-free available) notation on menus throughout this guide. Everybody loves bacon, but have you ever had duck bacon? It's on the menu at chef Adam Hegsted's the Wandering Table in Kendall Yards, served with a sourdough cracker, smoky aioli, tomato jam and lettuce. Duck is also on the menu at the Blackbird, in the form of wings that come with a Thai basil and sweet chili sauce. A few more less mainstream types and cuts of meats stood out this year, including the oxtail ravioli at Europa Restaurant, layered with an eggplant and tomato-based caponata sauce. A rustic, French country-style patê de champagne is not a dish local diners may see often, but it's on the menu at Durkin's Liquor Bar, along with braised rabbit and dumplings as an entree option. Southern-inspired flavors from many regions are strong standouts as well, like the street corn hummus — a fun, Mexican-Mediterranean mashup — at Tortilla Union Southwest Grill, featured as a starter and served with toasted pita bread, lime wedges and topped with cotija cheese and cilantro. Also Southern-based, but not from south of the border, is the Nola crawfish bread from Casper Fry, served warm with a crawfish salad spread. We also noticed a few bison-focused dishes, giving nod to the region's roots. Stuffed bison meatballs at MAX at Mirabeau are served with a Gorgonzola hazelnut filling, smoked sweet onion demi-glace, Yukon gold mashed potatoes and fried parsnip sails. Also find a bison burger at the Ref Sports Bar in Spokane Valley, topped with bacon, dry rubbed pork, cheese, onion rings, lettuce, tomato and a pickle. A great alternative to the traditional beef patty, ground bison tends to have a softer texture with an earthy flavor. Depending on what you order or where you go, three courses can be a lot of food to stuff down in one sitting. If a liquid digestif is more your style than something super sweet, there are many restaurants serving craft cocktails or other alcoholic drinks for the third course — you'll ease into bed later for a deep, full-bellied sleep. On the lightest side, Morty's Tap & Grille on the South Hill is featuring a fizzy cocktail made with local Warrior Liquor's blood orange vodka and sparkling white wine. Fruity and sweet is also an option at Charley's Grill & Spirits located just north of the Spokane River, and which has a lemon meringue pie martini, shaken and served up with lemon and Madagascar vanilla vodka, simple syrup, cream and a sour. What would an evening dining at any of the region's Twigs Bistro & Martini Bar locations be without a martini to finish things off? While each area Twigs location is serving something slightly different on its Restaurant Week food menu, at all three guests can choose the "Seeing Double" cocktail to end the night. It's made with Hpnotiq liquor and tequila, shaken with cilantro and lime and served on the rocks as a double. Wow! Bardenay Restaurant & Distillery in Coeur d'Alene has a couple of drinks-as-dessert options, including a chocolate martini and the Luchador, listed as "Patron XO cafe, half and half, Aztec bitters and a cinnamon stick, served over Icepresso cubes." Sticking true to its roots, O'Doherty's Irish Grille is serving a traditional Irish coffee for course three, made from 4 Seasons Coffee with Irish cream and whiskey liqueur and topped with whipped cream. The original print version of this article was headlined "What's on the Menu?"